Blackpool Brush car 623 relaunched in style! Following its recent return to Blackpool on loan from the Heaton Park Tramway for its 80th anniversary year, Brush Railcoach 623 has now entered service back on its original home tramway for the first time since November 2009. 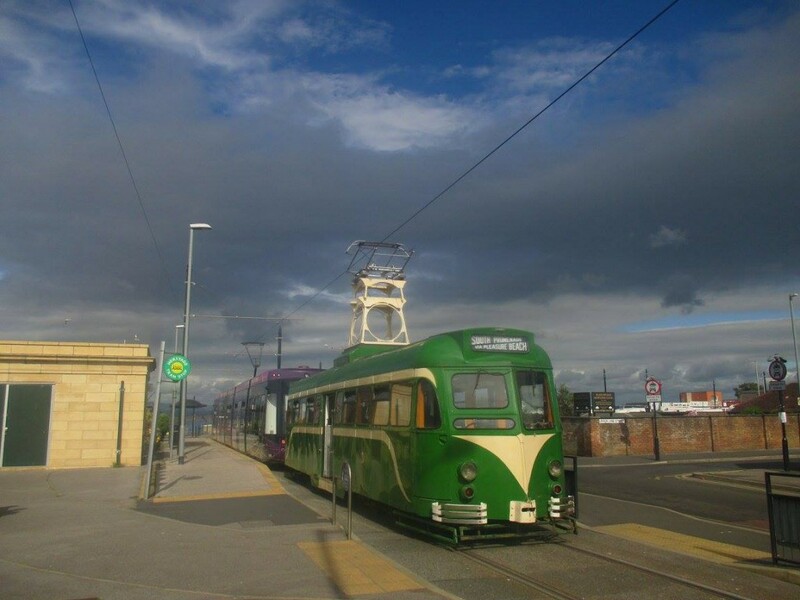 The tram was officially launched back into service with an evening outing for enthusiasts on Friday 14th July, and it was then used on heritage service over the next two days. 623 has received some attention in the Rigby Road workshops which seems to have done it the world of good; despite having experienced a few problems in the past few years with poor reliability, the tram ran faultlessly for three consecutive days and impressed many people with its superb performance. Indeed, it almost felt as though it had never been away! Less well received was the new ‘double deck’ trolley tower, fitted to enable a pantograph to reach the overhead wires without removing the short tower it acquired at Heaton Park, which would potentially affect the roof sealant. 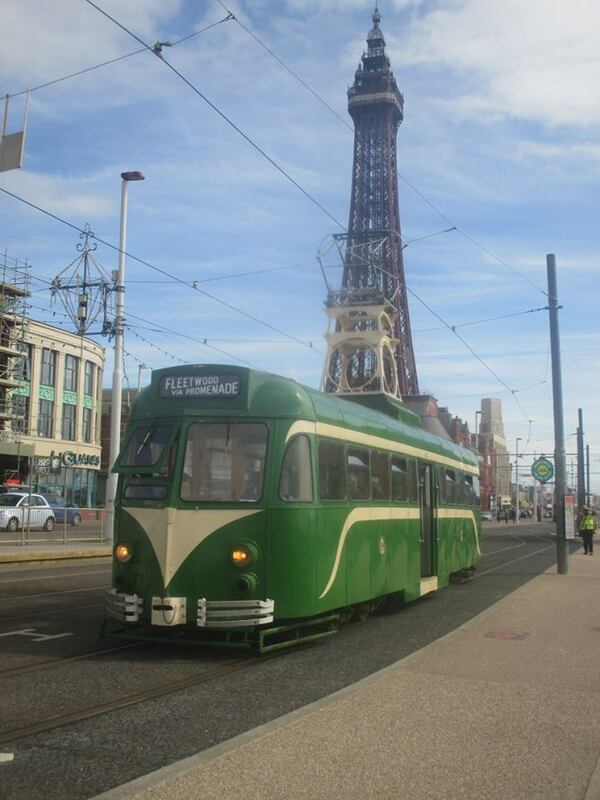 However, this one negative point seems to have been more than made up for by the beautiful smooth running and the smart wartime livery, a style much missed on the Blackpool tramway in the last few years. 623‘s launch tour on Friday 14th July commenced from outside the heritage tram depot in the late afternoon and took the Brush car to Fleetwood twice, with the first visit followed by a full length run through to Starr Gate. Attendance on this tour was rather disappointing, however over the following two days the tram proved extremely popular. Saturday 15th saw 623 make its debut on heritage service with an adventurous eight-car service, offering a heritage tram to Fleetwood every twenty minutes for much of the day, which attracted a lot of extra custom in spite of poor weather. 623 was then out again for the Fleetwood Festival of Transport on Sunday 16th, when it carried the various dignitaries to the event in the morning, and then ran in tandem with Ex-Towing Railcoach 680 (another tram on loan from Heaton Park!) for the rest of the day. By the end of the weekend, 623 had notched up eight journeys to Fleetwood, four of which were turned short at Fisherman’s Walk during the Sunday event, and the rest continued to the Ferry – not bad going at all and a timely reminder of the quality of the Brush cars! A timeless image with wartime liveried Brush car 623 and the Tower, but this is actually an important occasion as 623 graces the promenade for the first time in nearly eight years having just entered service on its inaugural tour. 7 Responses to Blackpool Brush car 623 relaunched in style! Brilliant adaption workshop staff. Genuine spare parts bin adaption. A bit Roman in the multi towers but how many will spot that Joe public probably wont. Very pleased with the cooperation that Blackpool and other operators have worked over the last few years to provide the current scene. Why are trolley poles rarely fitted now especially when they are more authentic on wartime liveried examples? 1. Pantographs are generally more reliable in service and less prone to dewirement. 2. The overhead is Blackpool is aligned primarily for Pantograph operation so trolleys need very careful setting-up to operate reliably. 3. not all drivers are trained for trolley-pole operation so pantographs allow more flexibility in crew allocation. The trolley tower does look a bit strange but so what? Better than damaging the roof sealant after all the time and effort that has been put into stopping leaks. A pantograph may not be authentic with wartime livery but neither is the 1960 fleet number for that matter. You can’t see the trolley tower and pantograph when you are contributing to the car’s presence by riding on it, and as oldvehicles says very few members of the public will be aware of the compromise, the roof isn’t usually the first thing they look at. The tram looks as lovely as ever. 623 was converted to pantograph operation upon refurbishment in 1990, when it was painted in an unremarkable advert livery for ICI. A serious fire later that year caused by the tram’s compressor overheating while in depot almost spelled the end for 623, but it was cleaned up and gave trouble free service until the abhorrent mothballing of 2004. To celebrate the 70th anniversary of the Brush car in 2007, it was repainted into Wartime livery and reinstated to traffic in place of 678. As I recall, it operated with a pan throughout its final few years at Blackpool, so its appearance is authentic from that point of view. Well done all. The latest visiting tram helps celebrate the 80th Birthday and demonstrates what can be achieved when groups work together in the interests of the wider tramcar movement. 623 quickly settled down into traffic and was like it never went away. These thorough bread horses certainly enjoy the freedom to stretch their legs on the full length runs that only Blackpool can provide. Felt like a caged tiger released back into the wild. Wonderful. Such a eye catching livery as well. Splendid to see it back running n its home system. Well done, everybody who made it possible.